The quesadillas are more than a recipe... they are a Mexican classical . Possibly one of the most popular dishes that can be found in the Mexican cuisine. The word quesadilla is a derivation of the word queso (cheese) and that’s the way they have been called since the XVIII century. The recipe is extremely simply as it only consists of a corn tortilla folded in half with melted cheese in the middle. Although with this recipe you will prove that in simplicity there is also a great flavor . It’s believed that the quesadillas are just an appetizer but they really are an everything . They can be eaten at breakfast time, lunch, dinner, as a snack and of course as an appetizer also. It always is a good moment to enjoy some quesadillas. The quesadillas also admit any type of accompaniment like: beans , salsas , dips , rice , beef , etc. This recipe is super easy to make, ideal for beginners that are looking for a great flavor. The quesadillas can be prepared with Chihuahua cheese, Oaxaca cheese, Manchego cheese, etc. The point is to use a cheese that melts. Do you want your quesadillas to taste exquisite... prepare your own corn tortillas. Heat on a griddle over medium heat 6 maize tortillas for about 20 seconds per each side, until they are soft. Put on each tortilla some of the cheese strips that were cut. Heat the quesadillas for approximately 1½ minutes per each side, until the cheese has melted. While the quesadillas are heated they can be pressed gently so the cheese melts better. Suggestion: In Mexico it has become a tradition to eat quesadillas with salsa , in fact there is no quesadilla that is eaten without salsa . So put your favorite salsa. Tip: Prepare some quesadillas with blue tortilla and feel the difference. Variation: Transform your quesadillas in... sincronizadas. In Mexico it has become a tradition to put “Salsa Valentina" to the quesadillas. Try them with this salsa you will love the flavor. The Salsa Valentina also has its spicy version. 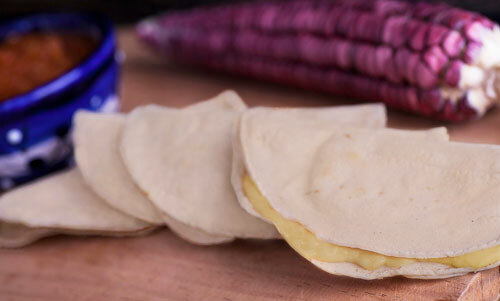 Buy “La Banderita Corn Tortillas" to make your quesadillas; they are soft, fresh, thin and they have very good flavor.